Happy 150th Birthday to the City of Redwood City! Monthly blog series to honor Redwood City’s past and celebrate the community’s history. The Redwood City Parks, Recreation and Community Services Departmenthas come a long way since its beginning when a young man named Alfred “Red” Morton started a recreational softball league in 1937. Today, the department provides hundreds of classes, camps, programs and services for many residents each year. This includes: after-school educational and sports programming for over 8,000 elementary school children; and specialized services to thousands of residents who need extra support. These programs bring over 100,000 visits to downtown each extended summer, and support hundreds of thousands of people in our 30 parks, plazas and playgrounds each year. Redwood City, which became the first city to be incorporated into San Mateo County in 1867, boasts a rich history that goes back to the days of the Gold Rush. The story of how the community grew from a tiny village on Redwood Creek into the city that it is today is reflected in some of our park names. For example, Mezes Park, nicknamed “Tank Park,” is named after someone who played a prominent role in creating today’s Redwood City — Simon M. Mezes. In the 1850’s, all of what is now Redwood City was part of a large estate known as Rancho de las Pulgas. This estate belonged to the Arguello family, who had been granted the land by the government of Mexico in 1835. After the Mexican War, people began to settle along Redwood Creek, hoping that the U.S. government would refuse to recognize the Arguello’s right to the property. Simon M. Mezes, who had come from Puerto Rico to practice law in San Francisco, was hired by the Arguellos as an agent to protect their land title. In 1854 Mezes succeeded in clearing the Arguello family’s title. In return for this service, the Arguellos sold him a large portion of their estate. Mezes then proceeded to sell lots for $75 each to the people already living in the village on Redwood Creek. He also completed a survey for a map of the town, which he named Mezesville. Although this name has vanished into history, the present-day arrangement of Redwood City’s downtown streets can be traced to Mezes’ map. Mezes donated two blocks to Redwood City for plazas. In 1905 one of those blocks was turned into a park then known as California Square. The other block eventually became Mezes Plaza. In 1928 the Veterans Building was moved onto the Mezes Plaza block. Two years later, the park site was cleaned up and shrubbery was planted. Two tennis courts were built in 1934, and in 1937 playground equipment was installed. 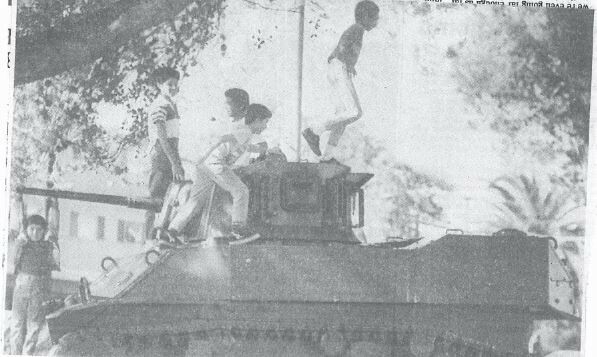 In 1947, at the request of the Veterans of Foreign Wars, an Army tank was placed in the park as a memorial to those who had served in the two world wars. The 16-ton M5 Stuart light tank was brought to Redwood City aboard a San Mateo County Fire Department truck and trailer. It was presented to the city by the American Legion as a war monument. There were several models of the light tank made by the Cadillac Division of General Motors, and the M5 was armed with a 37mm cannon as well as two machine guns. It was powered by twin 16-cylinder engines and could hit 36 miles per hour with some drivers reporting that it could go over 45 miles per hour. The M5 was outgunned in Europe but was used extensively against the Japanese. According to the American Armoured Foundation, the M5 tank is now quite rare, with only a dozen still existing. Over the years, Mezes Park has been renovated several times, most recently in 2013. Today the park offers 1.67 acres of grass space, a playground, tot-lot, basketball half court, tennis court, practice wall, picnic tables, and of course the tank. The park sits on the corner of Warren Street and Standish Street. For more information on Mezes Park go here.